Check out my new video on YouTube! I can’t believe Thanksgiving is next Thursday. Next Thursday, really? Where on earth did the past few months go? Around Thanksgiving, I usually take some time to reflect on the past year, think about family and friends and just reflect on everything that has happened, experiences, events etc. This year has been filled with lots of emotional ups and downs for me, my friends and my family . . sometimes, I have to ask why things happen for certain people, why they have to suffer and why we have to struggle so much. But, in the end, I just have to rest in knowing that God is in control of everything and all we can do is take it day by day. The hard times make us stronger right? This year, we will be spending Thanksgiving with my sister, her family and my parents and I am just thankful for my incredibly supportive and loving family. We didn’t always used to be like this. So close. My very strict Korean parents didn’t always so easily express their love for us. They were more doers. Providing me, my brother and my sister everything we ever needed and it wasn’t until we were older that the more emotional support and love was there. I don’t blame them. That’s how they grew up and they were just trying to survive and provide for our family. My sister is graciously hosting Thanksgiving at her new house this year. She just moved in, like a few days ago, so there are sure to be boxes and stuff everywhere. But, for my sister and I, it’s important that we all get together, just to be with each other this holiday season. We don’t care about the mess and the boxes won’t even be in our view because it doesn’t matter. My sister’s house, on Thanksgiving Day, will not only be filled with our family, but it will be filled with love .. and food! We always have an abundance of food at Thanksgiving. . and when I say an abundance, I mean, we get down. On the food. We eat and eat and eat and then eat some more. Taking breaks is key. After dinner, my sister neatly packs away all the leftovers and we make a “throw-everything-into-a-casserole-dish” casserole for breakfast the following day. 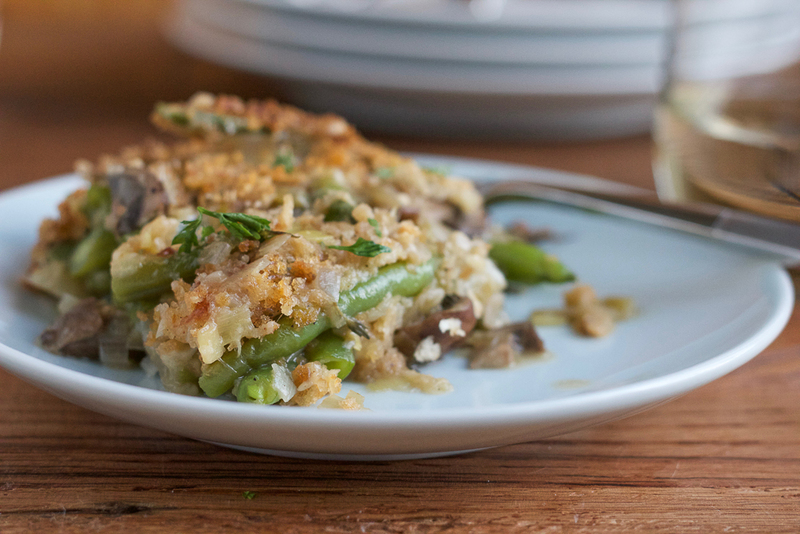 One dish I know for fact there will be no leftovers is this healthier green bean casserole. We’re all watching what we eat, we’ve all started exercising and getting into better shape so although there will be plenty of eating this Thanksgiving Day season, we’re not going to go crazy. The indulging happens but with the right balance. 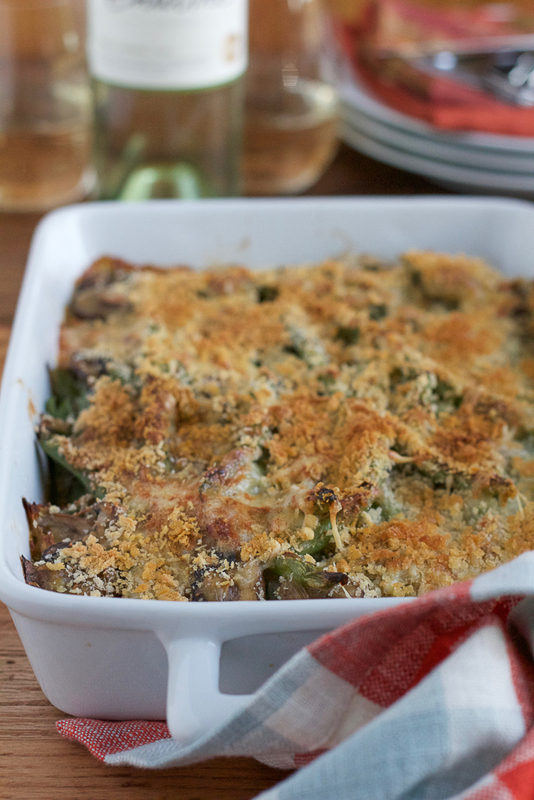 I absolutely loved this healthier green bean casserole! There is no cream of anything in here and I sautéed my fresh green beans with one my my favorite wines. This wine is “crisp, refreshing, and citrusy, like a green apple drizzled with lime juice and honey.” oh so delicious! You have to try this wine. 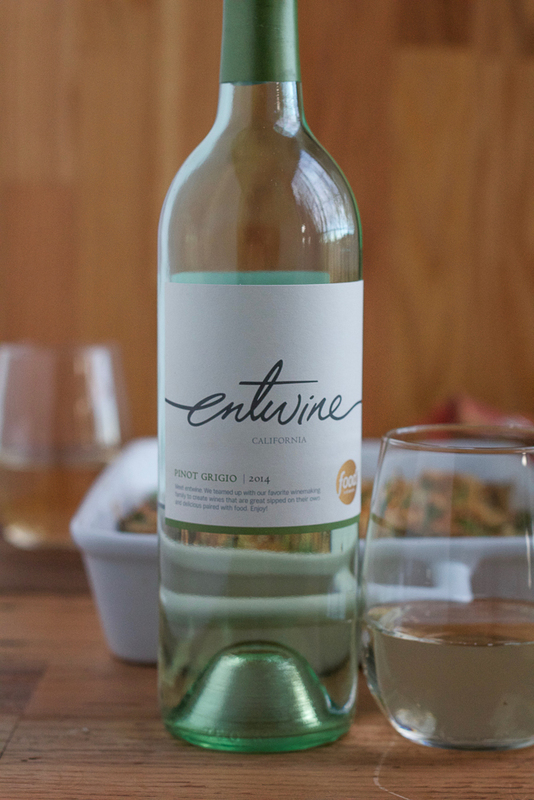 entwine’s Pinot Grigio is aged for 12 months in stainless steel tanks to maintain its crisp, fruity character. This wine pairs beautifully with salty cheeses, hors d’oeuvres and ham, so be sure to pick up a bottle for your Thanksgiving Day celebration! Wishing everyone a happy Thanksgiving and hope that you are surrounded by loved ones from near and far. *This casserole can also be made a day ahead. Read instructions below. Cook time = cooking time in the pan + baking time in the oven. *(If cooking right away) Preheat your oven to 425 degrees and spray your baking dish with non-stick baking spray, or grease with unsalted butter. Bring a large pot of water to a boil and blanch the green beans for just a few minutes. Then, immediately place the green beans into an ice water bath to stop them from cooking further. 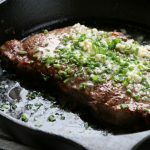 Using a large skillet, heat 1 tablespoon of the olive oil and, after a minute or two, add the shallots and leeks and sauté for about 4 minutes, or until they are beginning to soften and brown. Add the mushrooms and thyme, and season with salt and pepper. Cook the mushrooms for about 3 to 4 minutes. Slowly pour in the chicken stock (or wine), stirring occasionally until the liquid has evaporated, for about 3 to 4 minutes. 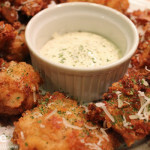 Evenly sprinkle the flour over the mushroom mixture and toss to coat. 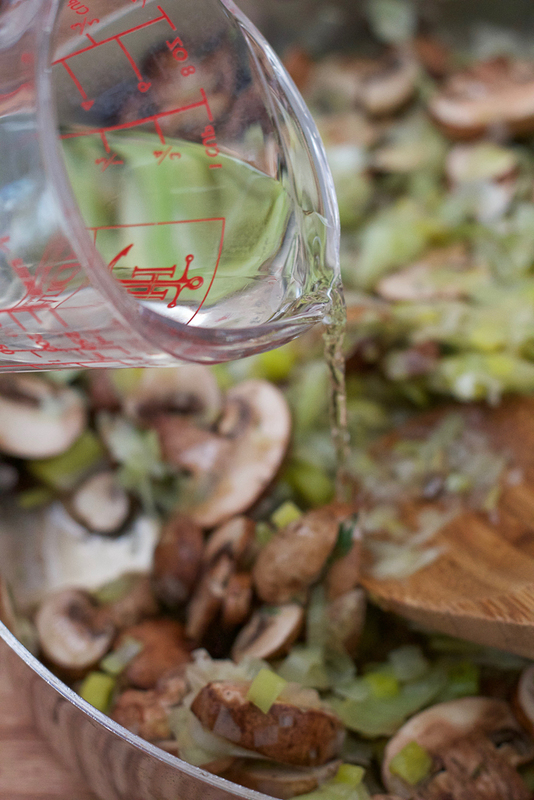 Add the vegetable broth and bring to a simmer, stirring often until the sauce has thickened, about 4 to 5 minutes. Remove from the heat and add in the blanched green beans and toss to coat, drizzling in the remaining tablespoon of olive oil if needed. Transfer to the prepared baking dish and top with the freshly grated parmesan and fontina cheese. At this point, if you are making this a day in advance, wrap/cover your baking dish and store in the refrigerator. When ready to bake: remove the casserole from the refrigerator and, using a small bowl, stir together the panko, paprika and nutmeg. Sprinkle the panko mixture evenly over the top of the casserole. Bake for about 35 to 45 minutes, or until golden brown on top. Let cool for at least 10 to 15 minutes before serving. Enjoy! Disclosure: This is a paid, sponsored post in partnership with entwine wines. All opinions expressed here are my own. Thank you for supporting me in working with the brands that I use and love. 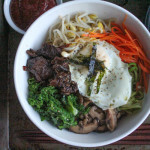 My Korean Food Fave: Bibimbap!! You are indeed right – there’d be no leftovers of this bean (and leek) casserole, Alice! Shashi, thank you so much for the thoughtful comment!!!! Wishing you and your family a blessed and happy Thanksgiving as well!!! GB casserole is hands-down my favorite veggie side of all time. 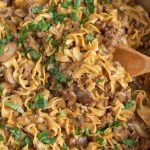 It just screams comfort food, and I love how your version looks! No condensed anything! Hope you have a great time with your sister and the rest of the family. Sounds like you all have found your happy place as a group, which is so important. And I love the fact that you’re all being healthy together! Green bean casserole is pretty much the best side dish, Alice! I’m loving that you made a healthier version. I think this would be devoured in my house in no time! Thank you so much, Gayle! Yes, we really loved this and I’m making it again for Thanksgiving! I love green bean casserole during the holidays! And I could totally go for some casserole along with a glass of that Entwine pinot grigio! Thank you so much, David!!! Happy holidays! 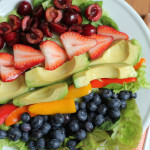 That looks like a delicious way to eat your veggies! I have never had green bean casserole before, but anything with beans and shallots is good with me! thank you so much Dannii!!!! I hope you try this. . I think you would love it! that fact that you used wine makes me so happy! must try this! BRILLIANT! haha, thank you so much, Lindsay!!! You know what..I’ve actually NEVER had a green bean casserole. I know, terrible Food blogger! BUT, this is the perfect way to start because I love that it’s lightened up! Pinned! Taylor, you have to try this! I think you would love it! LOOOVE the video Alice! I have cookies on the brain too! 🙂 I also have Thanksgiving sides on the brain, and I am totally digging this green bean casserole. Totally love that it is lightened up, because now I can indulge a weee bit more in everything! Plus there is wine in here, so that speaks to me. lol. This is perfect for everyone’s holiday table! Pinned! Cheers! My boyfriend is in charge of the green beans this year. Totally sending him this recipe! Aside from the stuffing, green bean casserole is my favorite food from Thanksgiving, and I’m ashamed to admit that I still make the canned kind, which completely goes against everything I believe in — all that sodium, preservatives. Ugh. I LOVE that you made a from-scratch lightened up version. It looks every bit as good as the original!!! Love this!! Lightening things up a few dishes on Thanksgiving definitely helps you get through the day a little more guiltlessly 🙂 this casserole looks just as delicious as the cream filled version! 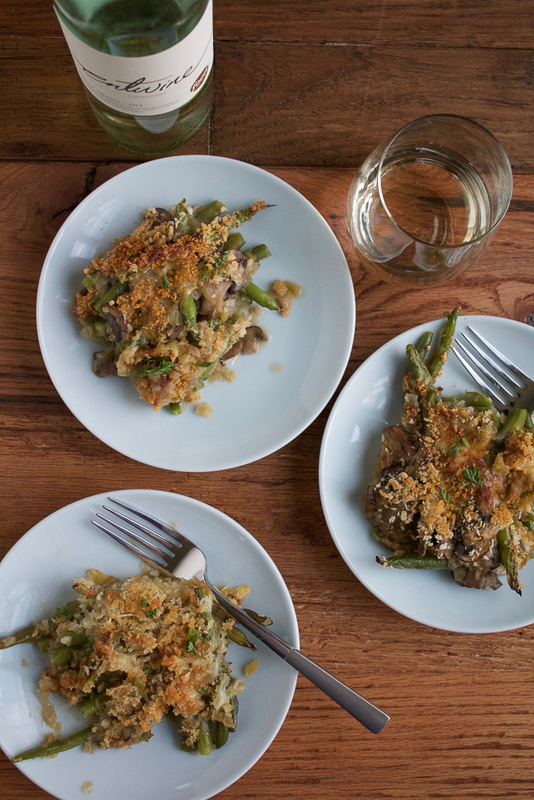 This green bean casserole is definitely going on my T-day dinner table. Love that it is lighter and healthier. Great recipe, Alice! Can’t wait to check out your new video! This green bean casserole looks amazing too! So glad you will get to spend Thanksgiving with your family at your sister’s new place, family time is the best <3 Love that you made this green bean casserole healthier without the cream of anything, it looks amazing!! You are such a natural in front of the camera (so is your little girl!) I would be umm-ing and um-like-ing my way through the entire thing. Those cookies sound amazing, so does this casserole! Awh, thank you Jen!!! very sweet of you to say that!!! 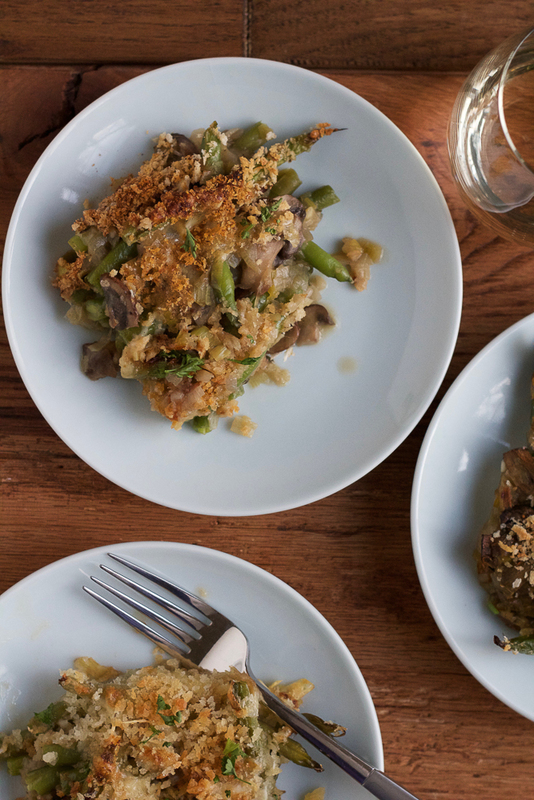 This healthier green bean casserole looks so much more delicious than the traditional kind. I’m not a big fan of cream of anything soups, but I sure am a fan of cooking with (and drinking) wine. And Pinot Gris/Grigio is my favorite! Cheers! Cheers to you Meghan! and thank you so much!!! Alice, I love green beans for as long as I can remember. My Mom taught me how to trim the ends before cooking. That was one of my jobs in the kitchen when I was much younger. 🙂 Thx! Your family Thanksgiving get-together sounds so wonderful! I want to come! Especially if this dish is going to be on the table. 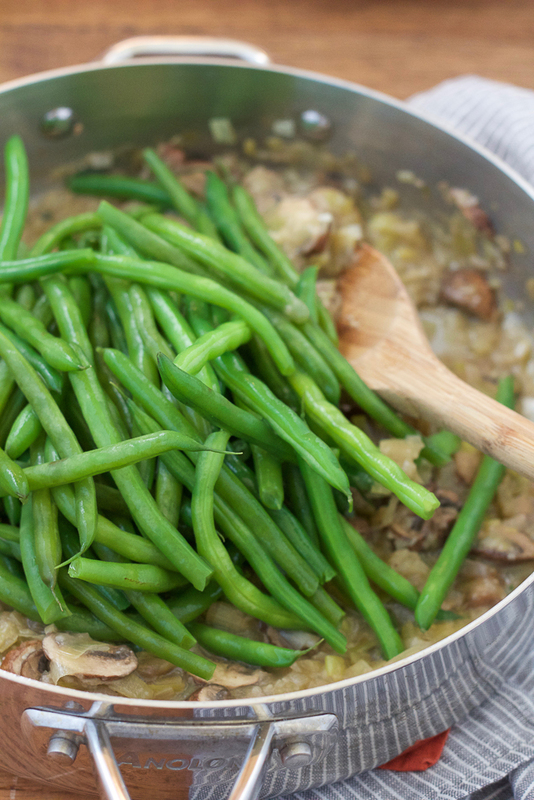 I love that you sauteed the green beans in white wine, and all the other add-ins sound so flavorful and delish! 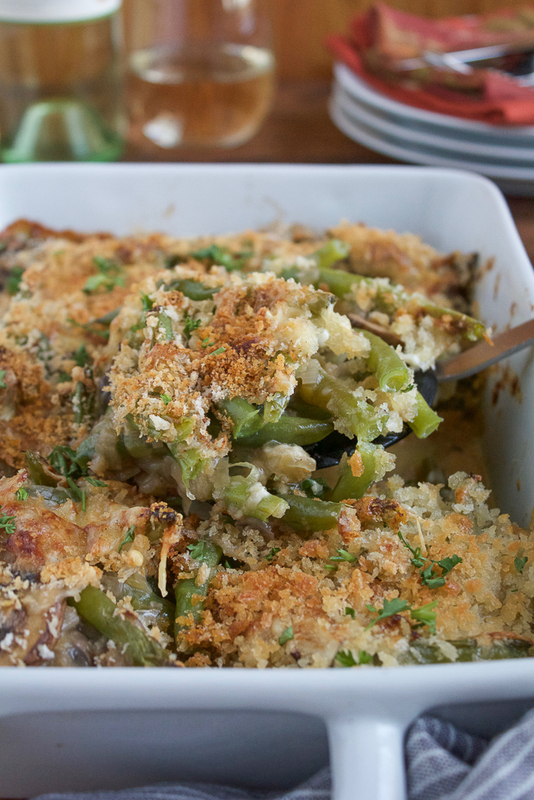 Love green beans and this casserole looks so good! Can’t wait to try the recipe! Perfect for Thanksgiving! Love the video! Thank you so much, Mira!!! Green bean casserole is always a must on every holiday table. Adding the parmesan and fontina has me very interested! Being Canadian, I am totally in Christmas mode already! 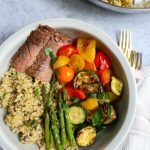 This casserole would be so perfect for a Thanksgiving or Christmas side dish, and I love how you lightened it up! One of my all time favorite side dishes. And healthier too? Absolutely awesome, thank you! Wow – I give your sister major points for hosting only a few days after moving into her new house. She is superwomen! So glad you can all be together at Thanksgiving. It’s my favorite Holiday because it’s all about food and family = the best stuff in life. Cheers, friend! Yummm! This casserole looks so delicious Alice! I’ve never tried green been casserole before, it sounds amazing. Such a great vegetarian dish too. And your video was amazing!!!!!!!! I loved it!!! 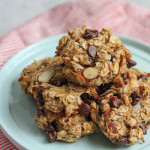 Seriously craving cookies now! I just adore a good green bean casserole! 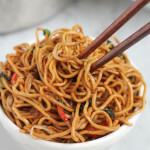 This recipe is definitely different than what I’m used to and I am SO DOWN! Yum! Love that you lightened up an old favorite! It looks phenomenal…and since it’s healthy(er) that means more STUFFING!!!! hooray! Loved your video! And this healthier rendition of a classic Thanksgiving dish. Calories can really get out of control on Thanksgiving! It is so nice to have a lighter option! 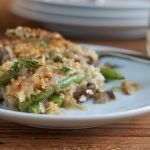 Green bean casserole is one of my favorites, and I love that this is lightened up! 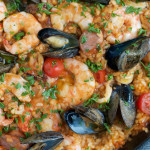 Using white wine for extra flavor is such a great idea! It sounds like you’re going to have a wonderful Thanksgiving at your sisters. You’re lightened up green bean casserole looks far more appealing than the overcooked, soup heavy versions we often see at our dinner table. Maybe I’ll suggest I bring the green beans for Christmas dinner and set a new trend. Enjoy the holiday!